Becca feels as if "there are pieces of me missing" and she is not quite sure where she is to find these pieces. This is a confusing time for the young woman for her brother is off fighting for General George Washington against the English while at the same time both her mother and her step-father make money by selling to and performing services for the English. She is therefore not too unhappy when it is suggested that she should go and work for the Shippen family in Philadelphia. They are a wealthy and well connected Quaker family who are in need of a companion/maid for one of their daughters. In return for her work Becca will be "finished" - that is given music and sewing lessons and taught the refinements of good manners and society. Becca hopes that she might even find her elusive "missing pieces" in such a refined environment. Instead Becca finds herself in the middle of a family battle and she also finds herself questioning which side it is that she supports in this war that is threatening to tear her world apart. Wherever she looks there always seem to be undercurrents of deception lying between the surface. Her beautiful new mistress, Peggy, is the most selfish, manipulative, and thoughtless person that Becca has ever met. Becca also fears that she detects some evil in Peggy, some unknown force which is dark and frightening. From the sidelines Becca watches Peggy flirt, manipulate and cajole her way through her world, almost always getting what she wants and having fits when she does not. Becca finds herself caught between what she sees as her patriotic duty and her duty to the family that she works for. While America soldiers die from want of adequate food and clothing Becca is forced to see her mistress and others like her spend enormous sums of money on clothes and foolish entertainments. 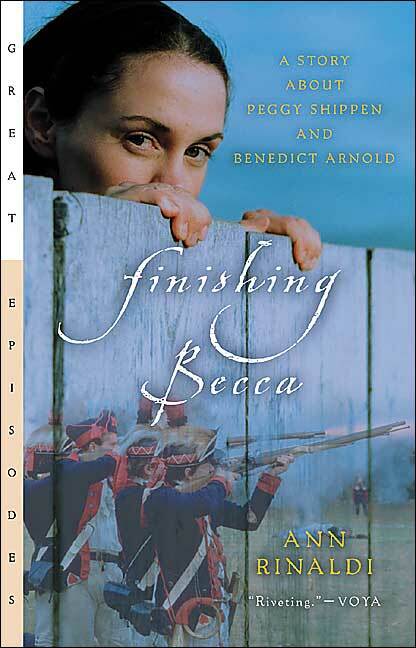 It is only when Peggy marries Benedict Arnold and Becca goes to live in the new household that Becca comes to see that finding one’s missing pieces in polite society can not only be discouraging and confusing, but it also can be dangerous. Against the backdrop of revolutionary turmoil and confusion, Becca’s own trials and the discoveries that she makes about herself, her family, and those around her are both powerful and thought-provoking. Seamlessly woven into the fiction are the historical facts which the author has carefully gathered and used to great effect. Ann Rinaldi further explains her thoughts about the historical background of her story in a fascinating author’s note at the back of the book.